Many mobile devices don’t support normal PC video formats like DivX, AVI, FLV (Youtube, MPG, DVD, DAT, etc. Either you need to use a compatible media player or another method is to convert them to 3GP, MP4 and AMR (audio) for proper playback on mobile phones. 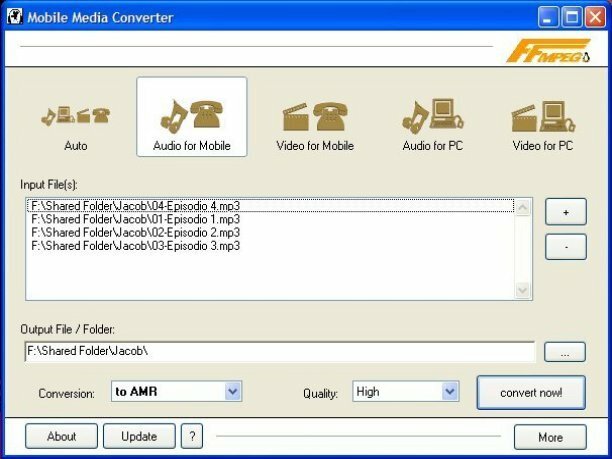 Here is a free video converter that can convert above mentioned PC video formats to mobile compatible video or audio files. Download it now. Just drag and drop the required video file ( in any of the format given below) to its interface to start conversion. Supports the following desktop and mobile formats. Desktop Audio: mp3, wma, ogg, wav. Mobile Audio: amr, awb, mp4. Desktop Video: wmv, mpeg, wmv, avi, flv. Download FLV, 3GP, Mp4 , AMR video converter for mobile here. This converter is a multi-platform software that will also work on Linux. But the download link given here is for the Windows version. my email id is snshusat161@gmail.com, please post some good software for my phone nokia 6300 for me on your blog. I am downloading converter after its use I will send comments. Video Converter Platinum is the most advanced total video converter which can convert between any video formats including MPG, MPEG, MPEG2, MP4, H.264, SWF, FLV, VOB, MOD, M4V, AVI, WMV, 3GP, 3GPP, MOV, DivX, XviD, QuickTime Video, DV, MJPG, MJPEG, MPV, etc, along with HD videos, like HD TS, HD MPG, HD MPEG, HD MP4, HD AVI, etc and extract audio from these video. It also converts between all audio formats including MP3, MP2, AAC, AC3, WAV, WMA, M4A, RM, RAM, OGG, AU, AIF, AIFF, APE, FLAC, NUT with excellent conversion speed and quality. Then you can easily full enjoy your portable player. You can use VIP Video Converter to convert any video / audio format to play on your mobile device (cell phone, ipod, iphone, etc.). VIP Video Converter is a free video converter, which supports more then 200 video formats, audio formats and physical devices. You can download a free version at: vip-video-converter.com . But i think the tool is not powerful enough, so not convenient for me. i currently use a tool which supports almost any video and audio formats conversion. also can free download video from dozens of video sharing sites. the name is Video Download Studio. i like its “automatic capture” feature, very fresh and convenient downloading way.